Lock in a great price for La Quinta by Wyndham Rochester – rated 8.6 by recent guests! It was a very pleasant surprise! My wife and I travel and stay in hotels quite often. We hadn't stayed in a La Quinta for quite some time. We usually stay at Hamptons because the quality is pretty consistent after finding that the overall quality of many hotels are inconsistent or subpar. La Quinta was excellent. Great rooms, clean, the staff very accommodating and the price, cannot be beat! Just a great hotel! I will recommend it to anyone I know traveling. The breakfast was good. All the employees were very friendly and helpful. Are room was very comfortable and clean. The pool and gym looked nice and well taken care of. The area around the hotel has many places to shop, eat, and find entertainment. The staff was very helpful , kind and friendly . Food was good and kitchen staff was very friendly and helpful when we needed help . Pool was amazing my daughter loved it ! We were supposed to have a corporate reservation - but it was not there. Host told me to check online - i could get a better price on booking.com than she could offer. Then they put on on the dog floor w/o warning (gave us the choice of 3 floors, but did not inform that the one we chose was the dog floor. We are allergic to dogs and down- but it took them 2.5 days to get us foam pillows. The whole floor smelled like dog vomit / feces by the elevator for 3 days because of an "accident". Then there was the 3 am dogfighting in the hall. And 3 times there were dog piles by our car door in the parking lot. Hotel waffles.....what more can I say :) Kids pool, large pool, and hot tub was great! The staff lady in the dining room...friendly, helpful. Our request for a shower chair an close proximity to the elevator was met. Stayed here for less than 12 hours, and everything was quick and convenient in that time. Dog friendly room was near exterior access. Handful of stores and restaurants within walking distance. Not good for reading... and think was missing a chair in the corner. La Quinta by Wyndham Rochester This rating is a reflection of how the property compares to the industry standard when it comes to price, facilities and services available. It's based on a self-evaluation by the property. Use this rating to help choose your stay! Featuring an indoor pool and a daily continental breakfast with waffles, fresh fruit, and more, this Rochester, Minnesota hotel is just 4.3 mi from the Mayo Clinic. Free Wi-Fi access is available throughout. 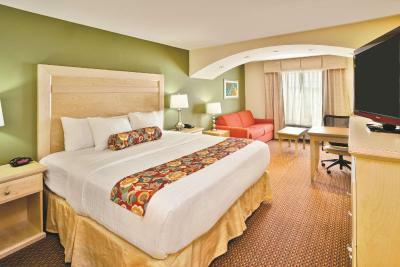 A 40-inch flat-screen cable TV is provided in every room at La Quinta Inn & Suites Rochester. For convenience, a microwave, fridge, and coffeemaker are also included. Featuring a bath or shower, private bathrooms also come with a hairdryer. Extras include a desk and ironing facilities. A fitness center is offered at Rochester La Quinta Inn & Suites, along with a relaxing hot tub. Other facilities offered include a laundry. The Shoppes on Maine can be reached in 7 minutes’ walk. Rochester International Airport is just 4.3 mi away. When would you like to stay at La Quinta by Wyndham Rochester? A microwave and fridge are included in this room, along with a 42-inch flat-screen cable TV and a coffeemaker. This double room has a 40-inch HDTV with a DVD player and a coffee maker. A microwave and refrigerator are also included. This double room has a sofa bed, flat-screen cable TV, microwave, and refrigerator. This double room has a sofa bed, cable TV, microwave, and refrigerator. This double room features a private entrance, tea/coffee maker and tile/marble floor. La Quinta Inn and Suites Rochester provides shuttle service to both the Rochester Regional Airport and to Mayo Clinic. We are also close to Hy-Vee, Fleet Farm, Hexum Companies, and other firms. Rooms feature refrigerators and microwaves. Enjoy free Ultra Fast wireless internet, daily free Bright Side Breakfast, indoor pool, business and fitness centers, free parking, and a guest laundry. Meeting room seats 40. All rooms nonsmoking. House Rules La Quinta by Wyndham Rochester takes special requests – add in the next step! La Quinta by Wyndham Rochester accepts these cards and reserves the right to temporarily hold an amount prior to arrival. I cant think of anything that needed improvement! No one warned us that there was an entire basketball tournament of young girls staying there. When we got into the elevator and saw a notice posted about the previous nights behavior we knew something was wrong. Tried to relax in the hot tub, but the entire room was filled with little girls screaming. Gave me a headache. No supervision from parents. The next morning it was impossible to find much to eat at breakfast. If I had known before hand that they were staying there, I would have paid extra to go somewhere else. Bed was hard to sleep on as well. Not much sleep. Thin walls, could hear the people in the next room coughing all the time. warn of dog floor, be able to help with best rate at counter, have a dog relief area other than the parking lot. Folgers coffee is AWFUL! There are not of restaurants near. There was black dog hair on the bathroom floor. Young girls hockey team running around slamming doors till midnight and early in the morning. The loud motor noise below our room 213. Had a very nice double queen executive room .